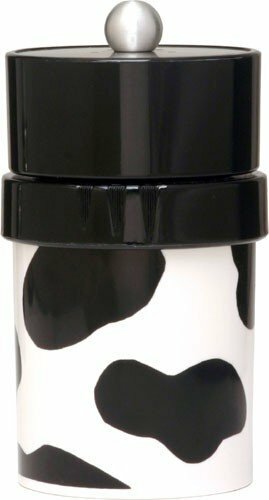 William Bounds 03759 Rita Combo Mill, Moo Cow was listed on Amazon for $18.00, selling for $18.00 USD brand new. Manufactured by William Bounds. There are 3 units left brand new. This is a combination mill with a acrylic body. It dispenses salt through the top and grinds pepper through the bottom. In the world of spice and pepper mills, William Bounds products are in a class of their own. They add a touch of sophistication and elegance to your kitchen and dining room. And because you are using freshly ground spices, they also add wonderful flavoring to your food. Because of this unique design there is no metal on metal grinding. Made in USA. Black and White spotted Moo-Cow pattern. Product prices and availability are accurate as of April 19, 2019 14:36and are subject to change. Any price and availability information displayed on the Amazon site at the time of purchase will apply to the purchase of the products above.